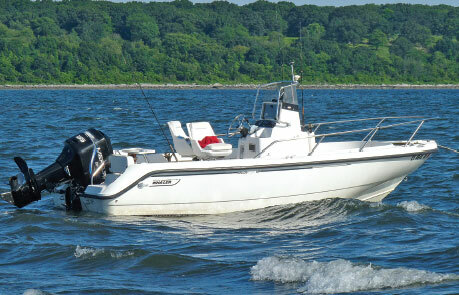 Seller had the boat hauled out and the bottom surveyed to make sure there was no moisture there. The seller wants it gone! Engines just serviced oil and filters. 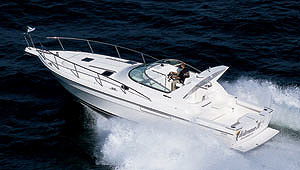 Substantial yet very sporty, the Legacy 40 Express is an exceptional runabout. 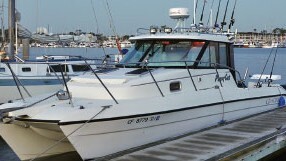 Her bridgedeck and cockpit are large and comfortably appointed, and visibility from the helm is excellent for even the shortest crew member. Though the engine compartment is directly underfoot, careful insulation and baffles keep noise levels well in check. 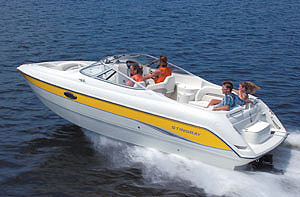 A large, hydraulic-assisted hatch provides access to the engine. A single-piece companionway door to port allows belowdecks access to the Legacy 40 Express. To starboard there is a curved settee, a table that does double duty at dining height or cocktail height, an entertainment center, and room for dish stowage. To port, there's a properly outfitted galley with a sizable refrigerated icebox, three-burner stove, oven, and double stainless sinks. 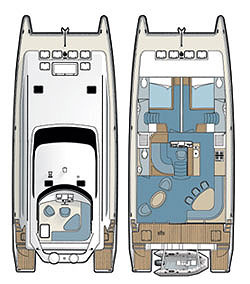 A well-sized head compartment is just aft with dual access to the stateroom and saloon. In the forward stateroom, there's a roomy island double berth with plenty of stowage beneath and in two hanging lockers. The Legacy hull is balsa-cored uni- and bidirectional E-glass and polyester resin with an outer laminate of vinylester resin for improved resistance to blistering. Directional weave fabrics are selected to orient the fiber in the direction of the loads, so that the Legacy 40's hull is as strong and as light as possible. High-density foam stringers replace conventional wood ones to eliminate the transfer of engine vibration and, again, to meet high targets of stiffness, strength, and optimal weight. Three structural bulkheads are glassed to the hull to form watertight compartments, and the hull - deck joint is bonded and mechanically fastened on six-inch centers to the inboard turning hull flange. Her sound insulation package is state-of-the-art baffling with foam and lead shielding; in addition - because wood transmits noise and vibration - a cored composite sub-sole is placed beneath the teak and holly cabin sole. All deck hardware on the Legacy 40 Express is forged of type 316 stainless for years of trouble free dependability. The bow rail surrounds the deck, extending the secure feeling of bulwarks in type 316 stainless, and only the best marine brand names have been selected in the outfitting. 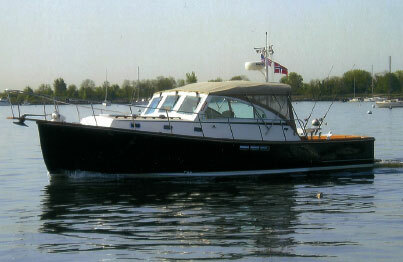 The Legacy 40 Express is built by hand in the USA and all major components are made in America.